So said Billy Strayhorn. Been here a week, and must recommend an amazing restaurant called Maceo (15, rue des petits-champs), run by the Willi’s Wine Bar guy, Mark Williamson. It was just a simple fillet of John Dory on a bed of spinach but suddenly, in the mix, was a bright orange-fleshed strip of what looked like an orange pepper -but turned out to be a slice of persimmon! The tart sweetness struck my tongue like a gentle clap of thunder -it was such a surprise! A Chablis from Raveneau that combined depth and finesse; a golden rainfall in the mouth. Paris does this to you, makes you speak this way. Place had it’s own lamps sculpted for it out of tin and lead -didn’t feel heavy; on the contrary, room had a light and airy atmosphere. After a week in London talking to director, publicity person and theater owner, don’t seem to have energy to explore Paris as exactingly as previously -but you gotta eat, and why not choose the best? More later. A wonderful, comfortable, bi-lingual train -from St. Pancras station in London to the Gare du Nord in Paris. Only trouble, no porters, no chariots (luggage carts), and though we both pride ourselves on having a gypsy attitude, dragging sixty pounds of suitcase plus fifteen pounds of computer on my back down a five-hundred yard train platform was enough to knock me out for the evening. However, a glass of excellent Sancerre in a local bistro soon revived me -and the apt./hotel gave our studio an upgrade to a suite! Wow! Tomorrow night going to the Casino de Paris to hear Petula Clarke -echoes of the sixties and beyond. Will have more to report soon. Scott Brogan, my Blogmeister, will be posting a happy picture here before long. Have a great week! Back November 14th to prepare Operation Ruby Slipper for late-month launch on Amazon. Meanwhile, you can check the International Judy Garland Club site for first reaction to the proof copy. 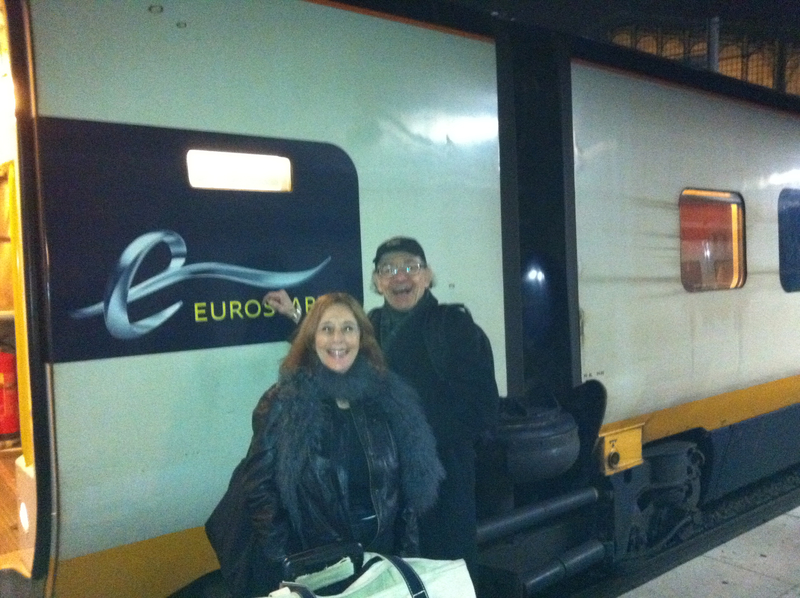 The Eurostar under th’ Channel from London to Paris!